By Gary Hynes, EAT Magazine, original post here. Leslie Ann Bradley slides into the seat across from me at Vista 18 on the 18th floor of the Chateau Victoria hotel and orders coffee. It’s a glorious sunny day and the view out the large windows takes in the Inner Harbour and downtown buildings. Even though she flew in from New York late last night she’s bubbly and enthusiastic—and not in the least bit tired. Ms. Bradley is an opera singer whose career is on the rise. 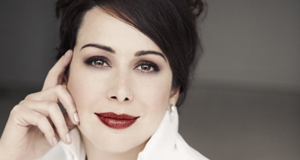 She’s in Victoria to sing the part of Countess Almaviva in the Marriage of Figaro, which opens at The Royal Theatre on April 24. We’re having coffee to not only talk about singing but also about her food life. EAT: What are your earliest food memories? L.A.B. My first memory is picking peas. I grew up on a farm near Port Perry in Ontario. Apparently I was a real thief. I remember the taste of roasted fresh picked corn, ripe field ripe tomatoes and those green peas—apparently I was a real thief. My dad is coming in to see the show so we’re going to go to the Root Cellar and the farm stands and poke around. He hates to see food imported when we have so much good food grown here in Canada. My other memory is I that had two pet sheep named Fuzzy and Wuzzy. They would lie down on the front porch and exasperate my mother because she couldn’t open the door. The story growing up was that one ran away, and a wolf had eaten the other. Finally my dad admitted (I was in my twenties) that we had eaten them. Maybe this explains that my absolute favourite meat is lamb. EAT: Are you a good cook? L.A.B. I am a very good assembler. If I can chop up some fresh veggies and put things in a salad I’m happy. I’m also pretty good at soups and I’m a good baker. I love vegetables— That’s my farm upbringing—and I’m not too fancy. My fiancée is a pretty good cook. He does an amazing Spaghetti Bolognese. I like to joke if we’re going to the farmers market that I need to take a book since he loves to look at everything. I eat well at home when he cooks. We’re both looking forward to eating at the restaurants here. He wants to go to Restaurant Matisse. My palate is getting more educated since I’ve meeting him. EAT: What can you tell readers about The Marriage of Figaro? L.A.B. When I was a teenager I bought the CD of the greatest hits of the Marriage of Figaro. I guess I’m a bit of a classical music geek. I knew very early that classic music was something that attracted my ear. Mozart wrote the Marriage of Figaro back in the 1700s. The music is so gorgeous and the melodies are accessible. We’re in the world of classicism – there’s not a lot of dissonance, there’s not a lot of strange things. Many people think of that period as being very straitjacketed, very aristocratic and not a lot of fun. But Mozart was a scallywag and opera is full of fun, hijinks, and love triangles – all the stuff we’re still making movies and writing books about today. It’s an extremely funny and intelligent opera. For some people sometimes the language barrier can be an issue because it’s in Italian and people are turned off because they think they won’t get it or understand. But with today’s technologies there are subtitles. 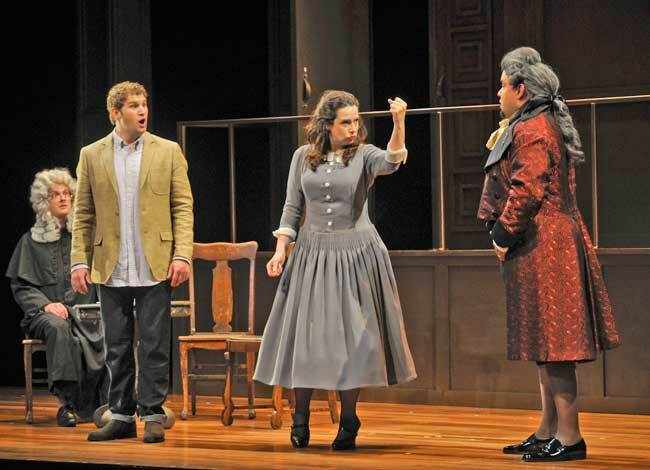 Most opera companies, especially Pacific Opera Victoria, are innovative and cutting edge. They’ll put on talks before the show and they’ll have great program notes so you walk in to the theatre and its not like it’s this big unknown. Pacific Opera Victoria takes great care to make sure their audiences will always be attracted to the opera. Western opera music needs to be kept relevant. Opera’s audience is growing older. Their kids are grown so they can go out at night more easily. But it’s not always about the diamonds and the glitz (although it can be fun to dress up for the night), now you see a lot of people wearing jeans or that have a bohemian look. Today’s audience is much more inclusive. The day of the diva is a thing of the past and that’s ok.
EAT: What other kinds of music do you listen to? L.A.B. I don’t like rock and I’ve never been into popular music. But there is one band I like called Walk Off The Earth. I’ve always been drawn to classical music. The more you listen to it the more you want to listen to it. EAT: You play the part of the Countess in the opera. Tell us about the role? L.A.B. Mozart is my first love and singing the Countess is one of my top five dream roles. She’s one of Mozart’s heroines. She has a humanity about her that’s still relevant. The Marriage of Figaro was controversial when it came out because it had the servants running the show and having better morals than the aristocracy. It was scandalous at the time. The Countess’ husband is a real dingdong and she has to find a way to take the power back. She gives the story a sense of heart. She starts as a woman who has lost herself and lamenting and then over the opera she schemes, she plans and is victorious. There’s tons of comedy but it’s always touching. At the end of the day she gives him what for but shows him compassion and forgiveness—what it’s like to be true nobility. EAT: Is there anything you eat in particular before a performance? L.A.B. I’ll eat a light meal about an hour before so you still have the energy to breath. Then afterwards we’re all starving. Generally some protein with lots of veggies so I get a slow release of energy. A video profile of Leslie . ~10 min. EAT: Is there a diet you keep to during the long rehearsal period? L.A.B. No alcohol, I keep caffeine to a minimum and I lower my dairy intake. I’m not super susceptible but some singers are careful not too much have too much acidic foods to protect the vocal cords. I try to eat healthy but still enjoy my day. EAT: First time in Victoria? This is my third visit. I was here in 2012 doing Carmen. This was a wonderful time when things were starting to take off for me. I have to thanks Tim Vernon and Patrick Corrigan for giving me a chance. Victoria will always, always hold a special place in my heart. What do you like to do in Victoria? L.A.B. I love to walk. I start at Mile Zero in Beacon Hill Park and walk along the waterfront – rain or shine. You take in the mountains and the ocean. And you can’t get better air as a singer. You get to Victoria and it’s like heaven for your lungs. There are so many shops and lovely restaurants. Zambri’s was fabulous. I love tea soI did Afternoon tea at the Empress Hotel with my grandmother. The cast likes to go toMurchies. We all love Clives. During rehearsal you don’t get much time but once the show opens you get a day in between shows to explore. L.A.B. In New York we like to go to smaller restaurants where we know the chef and they bring you whatever is interesting, fresh and in season. There’s this great place in Tribeca. We were walking by and thought that looks interesting so we went in and we said just bring us what you want. It was terrific experience. EAT What’s the best meal you’ve ever had and what music was playing? L.A.B. I remember a Thanksgiving we all gathered at my Gramma and Grampa’s place. We had the turkey, the homemade stuffing and the fresh vegetbles. Grandma is the best pie maker on the planet. A lot of my family plays musical instruments—there’d always be violins and pianos. Gramma and my aunt would play duets. We were really young at the time and they would play Napolean’s Last Charge and the kids would be running around the room. Homemade food and homemade music. That’s the best thing about food is it brings people together. EAT: If you could only one dessert for the rest of your life what would it be? L.A.B.Deep, rich chocolate cake with melted caramel. EAT: What’s your go-to drink? L.A.B. A nice glass of Pinot Grigio. That’s my after show drink. EAT: You’ve sung all over the world. What’s your favourite city? L.A.B. I ‘ve got to say I love New York. It’s such a mish mash. We recently discovered New York’sTenement Museum on the Lower East Side. It’s little, teeny museum that tells the story of urban immigrants coming to America. It’s housed in an untouched building from the early 1900s. There’s a food tour. They take you around the neighbourhood and you sample the foods of the various immigrant cultures—dumplings from an old hole-in-the-wall Chinese restaurant, there’s an old candy store. We also had typical Italian meatballs that would knock your socks and salt pickles from a store that only sells pickles! But I I have to say some of the best food I’ve eaten was in the French Basque region. I was in my early twenties. We all waited in the restaurant while they caught the fish, threw it on the grill and then cooked it. It was a revelation. What’s fun about food is your learn about the culture. L.A.B. Think of opera as visiting a really wonderful restaurant with a great chef. You won’t get a better chef than Mozart since is one of the best composers. For some people it will open up a world and change their lives. Pacific Opera Victoria has a really vibrant and alive company. Classic music is really strong here. I’m grateful to be here. The Marriage of Figaro opens at the Royal Theatre on April 24 with five performances running until May 4. For tickets visit the Pacific Opera Victoria website. 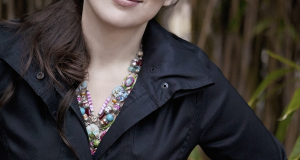 Leslie Ann Bradley will also be singing solo with the Victoria Symphony in Brahms Requiem on May 11. Visit the website for more information.